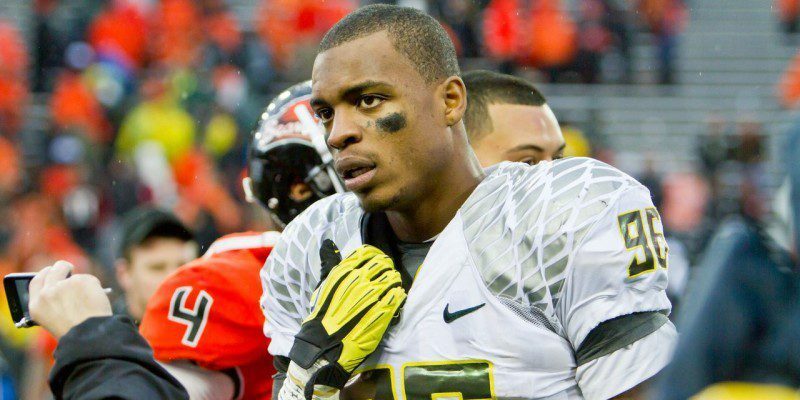 Earlier this morning former Oregon Duck, Dion Jordan, got some troublesome news. According to ESPN reports, the defensive end for the Miami Dolphins will be suspended for the entire 2015 season for violation of the NFL’s substance abuse policy. According to Adam Schefter, Jordan reportedly didn’t fail a test but rather submitted a diluted sample, which the NFL counts as a violation. Also, Jordan will not file an appeal. Jordan has already been suspended for violating the substance abuse policy not once, but two times. The first suspension was for the first four games of last year, but he got an additional two games after suffering another violation in September of 2014. Jordan has had a rocky start to his NFL career, and according to reports from a local Miami sports blog, Jordan was the only Dolphins player to skip voluntary workouts this offseason. Not a great look for the former Duck. 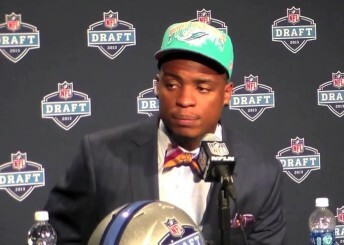 Dion Jordan at the 2013 NFL draft. Jordan was drafter third overall in the 2013 NFL draft when the Dolphins traded up to select the Oregon defensive end. He has only been in the NFL for two seasons, but many already consider him as a bust due to his lack of production and troubles with suspensions; and now following this full year suspension, Jordan will have a lot of work to do in order to salvage his career. During Jordan’s final year at Oregon, the junior defensive end was named first-team All Pac-12 and All-American, a far cry from his accolades in the NFL. In 26 appearances in his first two years, Jordan has 39 tackles and only three sacks as an NFL player. With arguably one of the best defensive lines in the NFL, Jordan was positioned fourth on the Miami depth chart behind defensive ends Cameron Wake, Olivier Vernon and Derrick Shelby. The Dolphins were supportive of Jordan during his suspension last season, but it is unlikely the team will stand by his side this time. Jordan was great as a Duck, but unfortunately for him his NFL career has gotten off to an extremely rough start. Everyone can root for a redemption story, and hopefully for Jordan, he is able to get the help he needs and begin his road to recovery and redemption.